Eighty Porter Toes: Happy Birthday Ivy!!!!! I can't believe it's been a whole year already!! 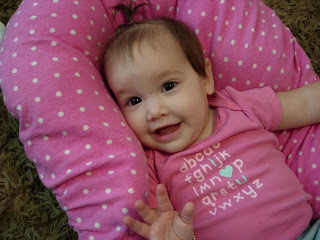 Ivy has been such a fun baby. 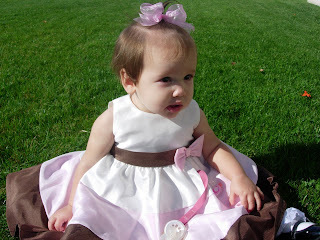 This was her birthday dress that my parents got her. 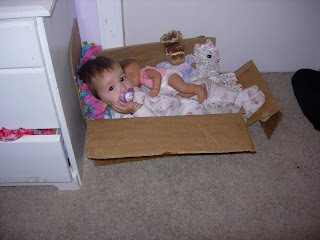 The next picture is a bed Syd made for her out of a box. She laid in it for at least an hour. We kept thinking she'd fall asleep, but no, just chillin!The next one is her bouncy seat she has re-discovered, and loves to drink her bottles laying in it. 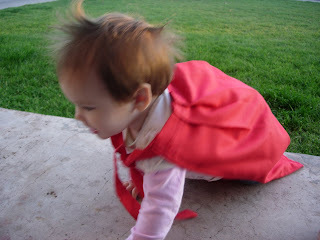 And last but not least, she loves to play out in the grass with the kids after school, and this day they put Carson's cape on her, "Super Baby" to the rescue. I totally didn't remember it was her bday today! Yay..happy bday! That is such a cute dress!!! So cute!!!! Time goes by so fast. 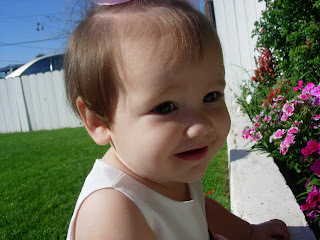 Happy Birthday precious little Ivy....she is simply beautiful. Wishing you a wonderful year!!! What a doll! She's darling of course and your grass is AMAZING! So nice and green! Love it!